Oven baked bacon? Seriously! Cooking bacon in the oven allows you to make large batches of bacon at once, with every slice evenly cooked and crisp! If you have ever wondered how to make perfect bacon every time, this recipe is for you! Today, we are mastering a life skill: Baked Bacon. At the end of this post, not only will you know how to make bacon that turns out impeccably cooked and uniformly crisp every single time, but you’ll also proudly refer to yourself as a bacon perfectionist. The secret to perfect fried bacon is that it isn’t fried; it’s baked. This is the method most restaurants use, and it is foolproof. Ever wonder how your favorite brunch or burger spot achieves those flat, thick, and magically crisp bacon slices? I’d wager my last piece that the bacon is baked. 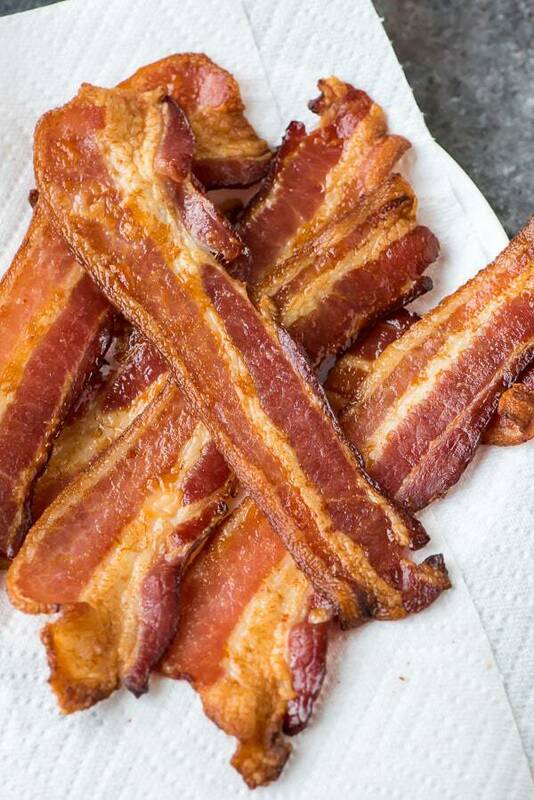 Oven baked bacon is easier to make and healthier than fried bacon. Baked bacon is one of those rare culinary situations where the method that yields a superior result (baked bacon) is actually easier than the conventional method (pan frying). Baked bacon is easier to make, easier to clean up, and won’t splatter you with hot grease while you stand at the stove to babysit it. 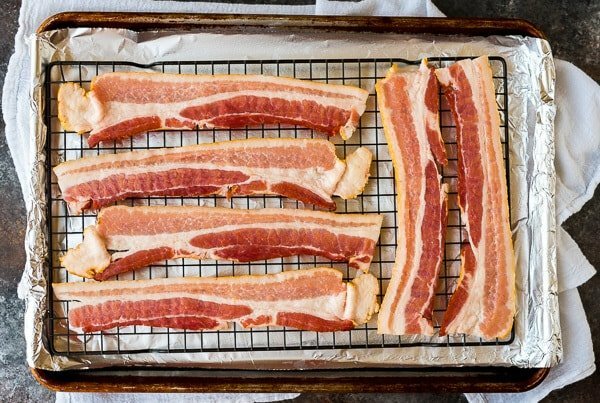 You can make perfect baked bacon in four easy steps. Ready? Let’s do it! 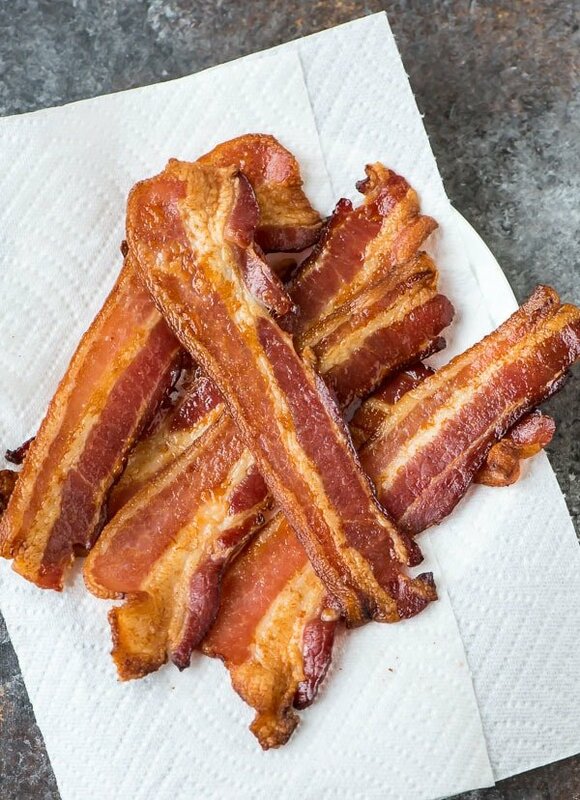 This might sound obvious, but I can’t overstate its importance: the better quality of bacon you buy, the better your final baked bacon will taste. I like to purchase mine from the butcher counter at the grocery store. It’s usually only a dollar or two more than the pre-packaged stuff, but the taste is remarkably better. Thickness wise, I like to go for the thick cut (no wimpy bacon here!). Bacon that is applewood smoked is always especially delicious. Grab a large, rimmed baking sheet (I swear by this one) and line it with foil for easy clean up. Then, instead of baking bacon on parchment paper or the foil directly, set an oven-safe rack on top of the foil. Most cooling racks (like this one) are also oven safe and can double for baking also. Give the rack a spritz with nonstick spray to keep the bacon from sticking, then arrange the slices in a single layer. The slight elevation of the rack allows the heat to circulate evenly around the bacon, a key component of bacon excellence. Pop the pan into a 400 degree F oven and try to be as patient as your kitchen fills with the tantalizing aroma of freshly cooked, hot bacon. Some recipes recommend baking bacon at 425, or starting the bacon in cold oven, but I found that a preheated 400 degrees F worked well for me. It’s also how to make baked bacon Pioneer Woman style, and I spotted Ina baking bacon the same way, so you know it has to be effective! The amount of time will vary based upon the thickness of your bacon and your desired crispness. It could be as short as 12 minutes for regular, thin-cut bacon or as long as 20 for thicker, slow baked bacon. During this time, you can brew some coffee, scramble some eggs, or watch ESPN highlights with your dog. The baking bacon time is totally hands free, so enjoy the break! At this point, your baked bacon is ready to eat. You can devour it directly off the rack, but I like to pat it dry with paper towels first. Removing the excess grease will keep it crispy for longer, whether you eat it right away or save it for another use. 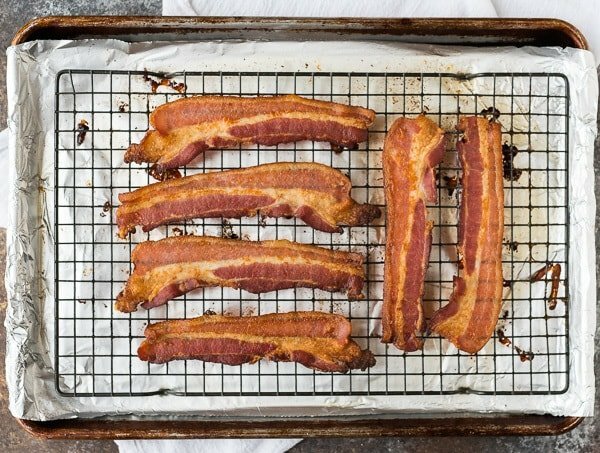 Is It Healthier to Bake Bacon? One of the great things about baking bacon using this method is that the grease from the bacon drips off and is collected below the rack, which means it stays off your bacon and out of your body! I also pat off any remaining grease with a paper towel to further reduce the amount of fat left on each slice. As a bonus, this makes the bacon crispier too. There are a few general rules of thumb to follow. First, if your bacon is in its original sealed package, you can go by the expiration date listed on the package. If you’ve already opened the package, make sure to cook up the bacon within 1 week of opening. If your bacon starts to change color or smell off before that, it’s safest to discard it. After cooking, bacon will last stored in the refrigerator for 3 to 5 days. If it starts to smell funny or change appearance, throw it out. Now that you’ve mastered the life skill of how to make oven baked bacon, it’s time to use it! In addition to the most obvious end (gobbling the slices up directly), baking bacon is an ideal method any time you have a recipe that calls for adding cooked, crumbled bacon, or if you want to make a standard recipe a little more decadent. Dice it and use it to top pizza or pasta, or layer the slices on a burger or sandwich. How good do Kalyn’s bacon cheeseburger meatballs sound? Jazz up your potato salad, like Chelsea does with her bacon ranch red potato salad, or convince veggie skeptics to finish their oven roasted Brussels sprouts with a little bacon sprinkle. Baked bacon slices also save for up to a week in the refrigerator, so you can make a larger batch of this oven baked bacon recipe and use the leftovers throughout the week. 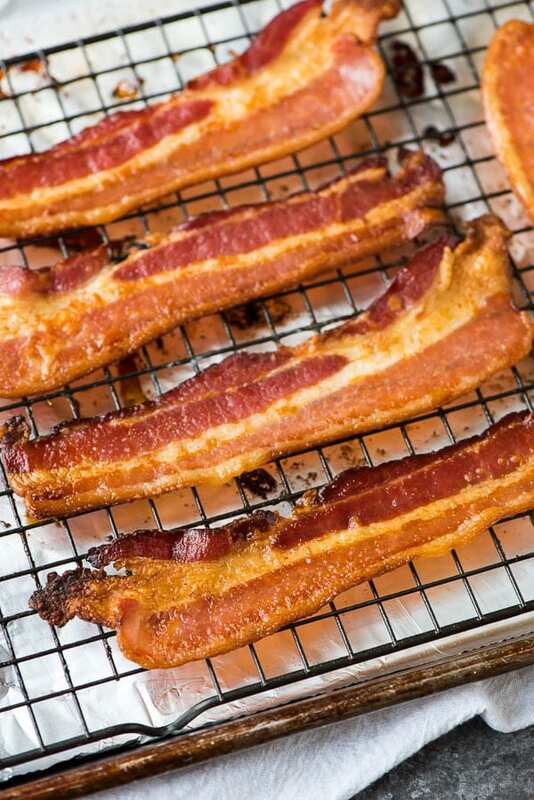 PERFECT Baked Bacon—Easy oven method that results in perfect, crispy bacon every time. This is the best way to cook bacon. So much better than frying! If making an amount of bacon that will fit on a single baking sheet without overlapping (about 6 to 8 slices, depending upon the bacon and sheet), place a rack in the center of your oven. If making a larger amount, place the racks in the upper and lower thirds. Preheat your oven to 400 degrees F.
Line a large, rimmed baking sheet with foil, then place an ovenproof baking rack on top. Spritz the baking rack lightly with nonstick spray. Arrange the bacon in a single layer on the baking rack. Bake until you reach your desired level of crispness. This could be as early as 12 minutes if you are using thinner bacon and like it less crisp or 20 minutes or more if you using a thicker cut and like your bacon really crispy. If baking two racks at once, rotate their positions halfway through. Once cooked, immediately transfer the bacon to a paper-towel-lined plate and lightly pat dry (this keeps it from getting soggy). Let cool just enough so that you don't (completely) burn your tongue. Devour immediately or use to top salads, pastas, and sandwiches, or in any of these recipes. To clean up: Let the bacon grease cool and harden, then crumple it up inside the foil and discard. If you'd like to use the bacon grease for another purpose, let it cool for a few minutes, transfer it to a lidded container or jar, and refrigerate. I like and recommend thick-cut applewood smoked bacon. The applewood smoke flavor is classic, and the thick cut provides maximum bacon crunch and full flavor. I also prefer center cut bacon when possible, as it is more lean and "meaty." If you can get the bacon from the butcher directly or from a local supplier, that's even better. With bacon, quality really counts, and it's worth the splurge. We are making bacon, after all. Leftover cooked bacon can be refrigerated for up to 1 week or frozen for up to 3 months. Rewarm gently in the microwave or use at room temperature. The only negative I can see in using this method – who gets to clean the oven? UGH! I used to have an electric stove and the oven door was removable which made the cleaning much easier. Your pictures of the bacon make me want to immediately cook up a batch! Chris, I’ve actually never had a problem with my oven getting dirty or the bacon splattering, which is one of the reasons I love this method. One reader mentioned that she had this same problem (oven splatter), but had never tried using a rack. Maybe that is the trick? You will not believe it, but I lay a double layer of paper towel on top of the alum foil to soak up the grease. No, it does not catch on fire! I also do this with baking chicken wings ala Rachael Ray style at 450 degrees on a rack with paper towels underneath and it also eliminates the smokey disgusting oven and aroma. Good luck. Give it a try! Samantha, I’ve actually never had a problem with it splattering, and I’ve always used a rack, so maybe that is the secret? If you try it with the rack, I’d love to hear how it goes! This sounds so good and I like the easy cleanup part of fixing bacon this way. That is one of my favorite things about it too Peggy. I hope you love this method! Yes! This is how we make our bacon all the time. It’s fantastic! Our son won’t have it any other way and trust me, I’ve tried! Loved the post! It really is a winner! Thanks Jen! You’re welcome, Alina! I hope this method is helpful for you! I love to make bacon this way and for special brunches I liberally sprinkle brown sugar mixed with cayenne pepper on top of thick sliced applewood bacon before placing in the oven. I am always asked for the recipe! I have never had trouble with splattering so it must be the the racks but they do need to be soaked and cleaned right after baking or the sugar is tough to clean off of them. That brown-sugar-cayenne sprinkle sounds amazing! Thanks for the tip, Trish! I have a hard time finding thick bacon without nitrates..love the butcher’s bacon but he usually doesn’t have the uncured. Try the big-box stores like BJs or Costco. I have to try this! Can’t believe I’ve never done it. Thanks for the shout-out for my Bacon Cheeseburger Meatballs! Made it this morning, very good! Only difference was here at 10,000 ft. It took around 15 minutes longer. Jean, I’m glad to hear it was a success! Thanks for sharing the high-altitude tip too. Thank you for that. I’m in a high altitude location and frankly I’ve never mastered the conversions for cooking up here — I need written instructions! So thank you. This made such a big difference. Thank you! Steps are easy to follow and the bacon is crisp but not burnt. Sherry, I am so so happy to hear this method worked for you! Thanks for taking time to leave this lovely review. Using heavy duty foil or parchment paper is a must when cooking bacon inthe oven. Also, rinse off your bacon with cool water and pat dry before you put them in the pan. This helps reduce shrinkage and helps the bacon cook better IMO. Using better quality bacon also yields better results. I use Hemplers or some other no nitrate, thick cut bacon and don’t have the splatter problem. What if you don’t have a rack? Claudia, you can bake the bacon right on the foil on the pan. I hope that helps! It was easy and quick. 12 minutes were perfect for think bacon that we are using for gourmet grilled cheese sandwich bar. Kim, I am so pleased to hear it, THANK YOU! Best way to make bacon!! Won’t do it any other way from now on!! No mess or splatter in oven and perfect every time! I’m glad it’s a winning technique for you, Shannon! Thanks so much for taking the time to leave this review! So NO TURNING the bacon. OVER? Nope! You leave it in a single layer and no need to flip. I hope you love this method! Been fixing bacon like this for years. I take a morning and using this method fix 4 to 6 pounds of bacon at a time. My crowd eats it on everything. I put it in smaller batches in a Ziploc freezer bag and freeze it. When you need some take it out the freezer put it in the fridge and it’s ready to go. And always save the grease in a jar in the fridge. Great for all the good country cooking seasoning. Thanks for sharing your great tips. Thank YOU for sharing your tips, Stephanie! 2. I’m not sure I trust anyone that believes it is possible. 3. That is a very disturbing concept. Cooked bacon has a shelf life of 2 minutes from cooked to in my belly.